Good weather at least gives us a break in this cloudy winter. Besides, strawberries are now in season, what means I can only think of them (well, and of chocolate, of course!). But ironically, now that I can use fresh strawberries… I go and bake artificially flavoured strawberry cupcakes instead of adding pureed strawberries to the dough or to the buttercream, like I’ve done before. It feels like cheating, but I had two reasons. 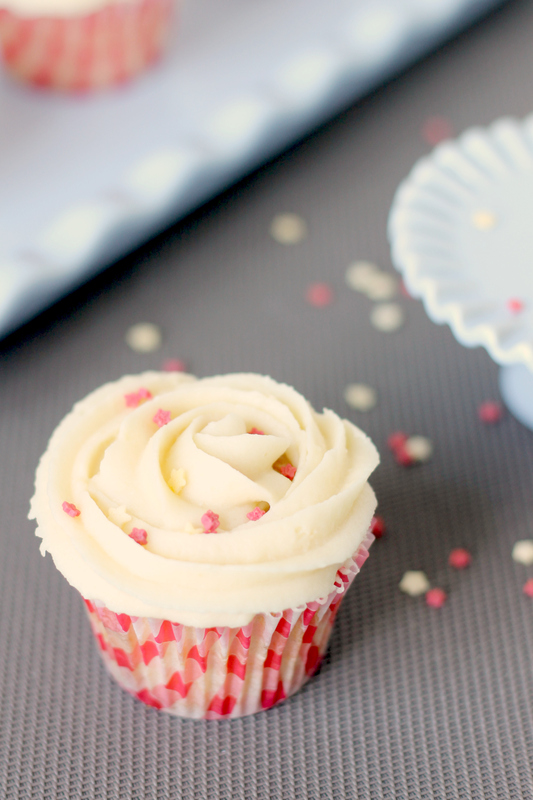 First… I manage to ate all the strawberries before making these cupcakes (oops! ); second, this recipe works all year round, as you don’t need fresh strawberries (the same principle underlying this recipe). 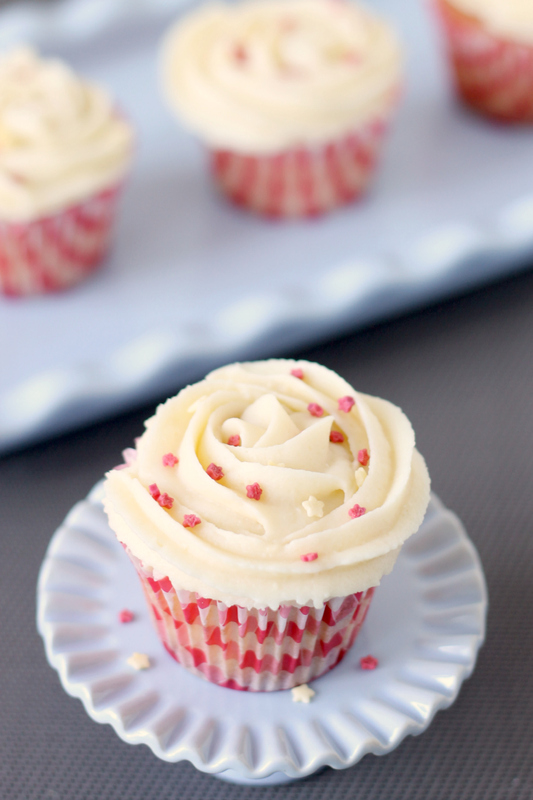 For these cupcakes, I have followed the recipe of basic vanilla cupcakes of the Hummingbird Bakery. 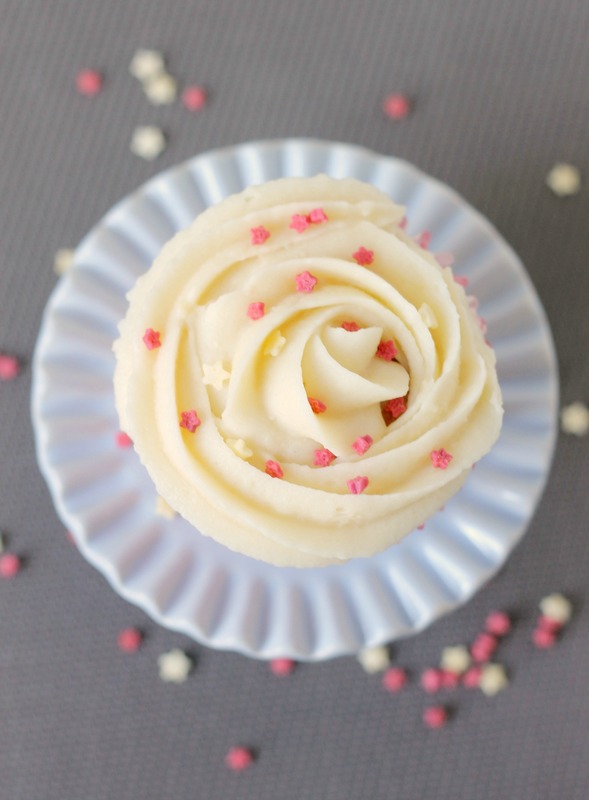 It is quick and easy to perform, and it yields only 12 cupcakes (more than enough for a small family like mine). And most important: foolproof and delicious. Preheat the oven, 180 ºC. Mix dry ingredients (flour, sugar, baking powder and salt) with the butter until sandy consistency (stand mixer: paddle attachment, speed 2-4, 2-3 min). In a separate bowl, mix the rest of the ingredientes (egg, vanilla and strawberry flavours, and the other 1/4 cup milk), whisk until well mixed. Then, pour into the previous mixture, and beat until incorporated and smooth (but do not overmix, just a couple of minutes, scraping the sides of the bowl in the middle). Divide the dough in the cupcake liners (do not fill higher than 2/3 of the height; this task is better performed with an ice cream spoon). Bake 20-25 minutes, until the tops are golden and a skewer inserted into the cupcakes comes out clean. With the paddle attachment, beat the butter, icing sugar and milk at low-medium speed for several minutes (until light and fluffy). Meanwhile, melt the chocolate in a double boiler or in the microwave (medium power, checking and beating each 30 seconds). Add the melted chocolate to the butter mixture (the chocolate must be slighlty warm: not too hot to melt the butter; but not too cold to solidify again). Beat until integrated and smooth.